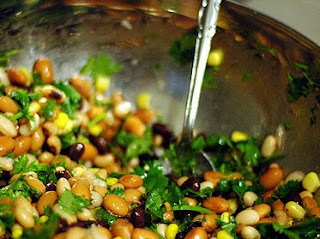 Make this big bean salad ahead of time so it can chill and flavors can blend. As a bonus you’ll have more time to enjoy camping. Serve it as a salad or a cold, vegetarian main dish. It keeps several days in the ice chest or fridge. with dried chives. Makes 12 salad servings, 6 main dish servings for a cold supper. Thank you for the meat-free recipe! More please!